To some people, surrender may have negative connotations, implying defeat, giving up, failing to rise to the challenges of life, becoming lethargic, and so on. True surrender, however, is something entirely different. It does not mean to passively put up with whatever situation you ﬁnd yourself in and to do nothing about it. Nor does it mean to cease making plans or initiating positive action. Surrender is the simple but profound wisdom of yielding to rather than opposing the ﬂow of life. The only place where you can experience the ﬂow of life is the Now, so to surrender is to accept the present moment unconditionally and without reservation. It is to relinquish inner resistance to what is. Inner resistance is to say “no” to what is, through mental judgment and emotional negativity. It becomes particularly pronounced when things “go wrong,” which means that there is a gap between the demands or rigid expectations of your mind and what is. That is the pain gap. If you have lived long enough, you will know that things “go wrong” quite often. It is precisely at those times that surrender needs to be practiced if you want to eliminate pain and sorrow from your life. Acceptance of what is immediately frees you from mind identiﬁcation and thus reconnects you with Being. Resistance is the mind. Surrender is a purely inner phenomenon. It does not mean that on the outer level you cannot take action and change the situation. In fact, it is not the overall situation that you need to accept when you surrender, but just the tiny segment called the Now. For example, if you were stuck in the mud somewhere, you wouldn’t say: “Okay, I resign myself to being stuck in the mud.” Resignation is not surrender. You don’t need to accept an undesirable or unpleasant life situation. Nor do you need to deceive yourself and say that there is nothing wrong with being stuck in the mud. No. You recognize fully that you want to get out of it. You then narrow your attention down to the present moment without mentally labeling it in any way. This means that there is no judgment of the Now. Therefore, there is no resistance, no emotional negativity. You accept the “isness” of this moment. Then you take action and do all that you can to get out of the mud. Such action I call positive action. It is far more effective than negative action, which arises out of anger, despair, or frustration. Until you achieve the desired result, you continue to practice surrender by refraining from labeling the Now. Let me give you a visual analogy to illustrate the point I am making. You are walking along a path at night, surrounded by a thick fog. But you have a powerful ﬂashlight that cuts through the fog and creates a narrow, clear space in front of you. The fog is your life situation, which includes past and future; the ﬂashlight is your conscious presence; the clear space is the Now. Non-surrender hardens your psychological form, the shell of the ego, and so creates a strong sense of separateness. The world around you and people in particular come to be perceived as threatening. The unconscious compulsion to destroy others through judgment arises, as does the need to compete and dominate. Even nature becomes your enemy and your perceptions and interpretations are governed by fear. The mental disease that we call paranoia is only a slightly more acute form of this normal but dysfunctional state of consciousness. Not only your psychological form but also your physical form — your body — becomes hard and rigid through resistance. Tension arises in different parts of the body, and the body as a whole contracts. The free ﬂow of life energy through the body, which is essential for its healthy functioning, is greatly restricted. Bodywork and certain forms of physical therapy can be helpful in restoring this ﬂow, but unless you practice surrender in your everyday life, those things can only give temporary symptom relief since the cause — the resistance pattern — has not been dissolved. There is something within you that remains unaffected by the transient circumstances that make up your life situation, and only through surrender do you have access to it. It is your life, your very Being — which exists eternally in the timeless realm of the present. Finding this life is “the one thing that is needed” that Jesus talked about. 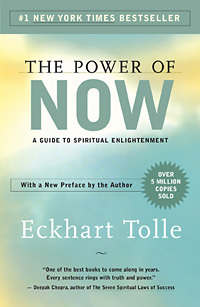 Eckhart Tolle is the author of the New York Times bestsellers The Power of Now and A New Earth, which are widely regarded as two of the most influential spiritual books of our time. Visit him online at www.EckhartTolle.com.